St George's day nursery is very proud to have received Outstanding at our Ofsted inspection on 22nd January 2018. This website has been designed to help both new parents with finding out information about our setting before their visit, and also to help current families with updates and information regarding the nursery. Should you require any further assistance with any questions or information, then please do not hesitate to contact a member of the team who will be only to happy to help on the contact details provided. St George’s Day Nursery is delighted to say that we will be offering the 30 hours funding scheme from September 2017. The funding will be offered over a stretched funding programme, with further information available from the nursery on request. We will also still provide the 15 hours stretched funding for 3-4 year olds and 2 years old if your family is eligible. Please do contact us should you have any enquiries regarding funding. Hello my name is Kimberley and I am the manager for St George’s Day Nursery. I have been working in childcare for 18 years, and have spent the last ten years working for St George’s. As a nursery manager I am dedicated to enriching the children’s welfare and learning, through promoting a safe, secure, caring and varied environment for them to thrive in. I am also a believer in continuous personal development for myself and my staffing team, to ensure we provide the best care for the children. St George’s has a strong family ethos, and we like to encourage family members to come into nursery to join us for various occasions, festivals and events. Through these events we have built up close bonds with all our families, which I as a manager feel is a vital part of our role. 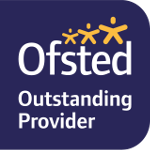 We have been recognised by Ofsted as an Outstanding Provider in our 2018 Early Years inspection report. Having recently set up this new website, the nursery team would be most grateful for your feedback or any suggestions you may have regarding the site. Please email me at the email address at the top of the page. St Georges Day Nursery (Hanworth Park) Limited is registered in England and Wales with company number 04690765 and registered office at 73A High Street, Egham, Surrey, TW20 9HE.